CHAMPAIGN, Ill. — Beware the jumping cholla, Cylindropuntia fulgida. This shrubby, branching cactus will – if provoked by touching – anchor its splayed spines in the flesh of the offender. 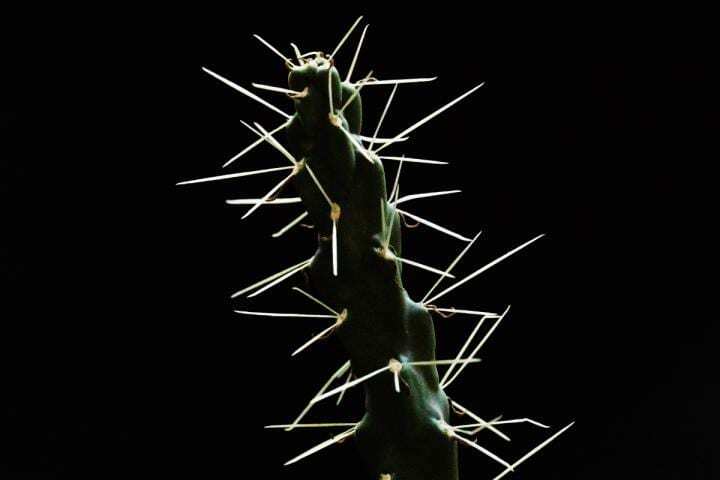 The barbed spines grip so tightly that a segment of cactus often breaks off with them, leaving the victim with a prickly problem. “We’re looking at the fundamental mechanics of a puncture event and how differences in cactus spines – in particular their microstructure – affect how they puncture and anchor into whatever they’re puncturing,” Crofts said. To compare the different spines, Crofts and Anderson tested them in skinless chicken breasts, pork shoulders (with the skin) and synthetic elastomers of differing densities. They measured how much force was required to puncture – and withdraw from – each material with each type of spine. “Then the barbs catch on your muscle fibers, making it difficult to remove them,” he said. The researchers detected reliable differences in performance between the cactus species. For example, O. polyacantha “required significantly more work to withdraw from the chicken than any other species,” the team found. Cholla spines were significantly more difficult to withdraw from pig tissue. In fact, a single cholla spine could hoist a half-pound hunk of pork up by its skin.